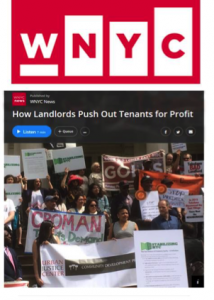 Tenant harassment and displacement as a business strategy threatens New York City’s rent-regulated housing stock, one of our most important sources of affordable housing. New York City has over one million rent-regulated units, nearly half of all rental units. Rent-regulated housing is typically more affordable and provides more rights and protections for tenants than market rate units. ANHD has long stated that access to credit is critical to maintaining this stock of housing in the City, especially in lower-income neighborhoods. Today, however, lack of lending isn’t the issue – it’s the quality of that lending. Equally important to the volume of lending, if not more so, is that the loans are underwritten responsibly. Speculative loans and loans to bad actor landlords open the door to a type of discrimination known as “predatory equity.” Unlike the practice of redlining that locked people of color out of the housing market, predatory equity investors make loans in communities of color, in low-income communities, and where low-income people live, but base those loans on highly speculative underwriting. In these cases, the current rents do not support the costs of the loan and maintenance. Such loans have led to the widespread harassment and eviction of lower-income tenants in order to pay off the loan. WNYC released a report today outlining how predatory equity works and the damage it inflicts on tenants. They follow tenants in buildings formerly owned by the now notorious Raphael Toledano who took out multiple high-cost loans from Madison Realty Capital, a non-bank lender. But Toledano is just one of many such landlords who take out loans from both banks and non-banks to finance their destructive behavior. ANHD found that New York City lost 156,000 units of rent-regulated housing from 2007-2014, some of which we were lost due to predatory equity practices, such as those outlined in this story.